My small business specialises in the design, supply and installation of kitchens, bedrooms and bathrooms. With my penchant for computing it’s no surprise we rely heavily on information technology. However, I don’t write and build all the software we use and that’s especially true when it comes to CAD [Computer Aided Design]. On the surface, CAD is really simple. Draw some lines on the screen. Colour in some spaces, print some pictures and maybe export some things for other software. So far, so good. Of course, the devil as always is in the detail. We need our software to draw the pictures based on products and materials we can buy from our suppliers. We need it to generate accurate plans and we need it to generate respectable pictures so our customers can visualise what they’re going to (hopefully) buy. Being the type of business we are, a lot of what we do includes unique and bespoke configurations. ‘Simple’ things like doors shaped to fit a ceiling and exceptional work like the Star Field ceiling. From shortly after we began our business almost 20 years ago we’ve been using software called ‘Planit’, which then changed it’s name to became ‘Fusion’, which then changed it’s name to become ’20-20 Fusion’ (as Planit were bought out by another CAD company called 2020). This is an industry specific program. Rather than use a generic CAD program which just creates the graphics and images (maybe AutoCad or Sketchup are good comparisons to this), this program lets us choose and add cabinets quickly to the design and then also shows the price for all the items we’ve added. Being industry specific it also is set up to do things we need quickly. For example add and calculate cornice and pelmet lengths and quantities for a room in a few clicks of the mouse. All of these things can be done in products like sketchup, they just take longer. The ranges we can add in Fusion represent the real world ranges, with accurate and ‘photo realistic’ representations of real products. Indeed, this is the whole reason for using Fusion – the accurate range of products and the prices. Without that, the product is no better than any other generic design program. We pay over £1,000 a year to 2020 for ‘maintenance and support’ (not the same as the licence to use the software, which was several thousand pound as a one off charge a long time ago) but we’ve come to some disagreement recently over what that actually means. To me, that means they provide the software and updates to that software over time (eg: making sure it works with Windows 10, adding features to keep up with modern technology) and most importantly they’ll keep up to date with changes the manufacturers make to their products, be that new products, new pricing, new shapes of end panel… and so on. Most of the software updates over the last few years have been minor from our view, we simply don’t need bells and whistles as much as we need accurate 3D objects and prices. It’s the accurate 3D objects and prices that have become a problem. I understand your frustration with catalogue updates. However the maintenance & support monthly fees include software updates pertaining to the Fusion software, manufacturer catalogues updates are maintained as per the contract agreement with each manufacturer. I don’t understand how that sits alongside the support renewal letter (2013-14 was the first I found) which says things like ‘Full access to our extensive library of supported manufacturers catalogues’ and ‘maintenance and updates to certain selected catalogues’. I’m also struggling to reconcile that with their brochure, which says things like ‘Instantly produce customer quotes, with all manufacturer items accurately priced, based upon the features and options chosen.’ (page 2) and “We are continuously working with manufacturers to forge new and lasting partnerships, ensuring that our customers benefit from the widest range of options available, delivered in parallel with the release of their product manuals.” (page 6). Without the manufacturer catalogues, there is no useful program. Crown Kitchens ‘Rococo’ range, released almost a year ago (I have, to hand, a price list from May 2015 that offers this range) yet still not in the Fusion catalogue. PWS end panel with a radius front profile, no graphic despite availability for a long time. Those 3 suppliers are listed in the Fusion marketing brochure (page 6) and yet clearly Fusion are not updating the data. Why? Well, I started asking questions (it appears I’m not the only one) and eventually I have a reply. Fusion are trying to charge the manufacturers as well as me for keeping the data up to date. Perhaps they always did and perhaps the manufacturers have decided Fusion want to charge too much. This means the updates aren’t done, this means the software is becoming useless. OK, useless is harsh, it’s becoming expensive and ineffective for it’s original use. It is no longer fit for purpose. 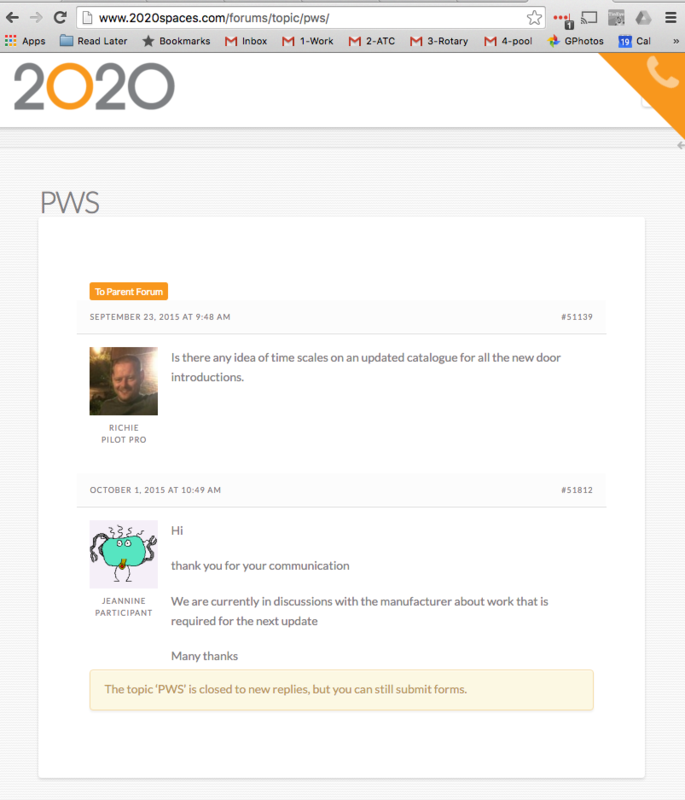 Yes there has not been a update on the PWS Second nature catalogue for a while, this is due to the manufacturer not providing us with the latest information. I am very certain that there is a update due soon, i will double check with my colleague in our data team and get back to you. I have looked through our outstanding data errors and i can see that you reported a missing item from PWS. Data can you provide some info on the below concern please, as the customer is quite frustrated. Sales are currently in discussion with Crown and PWS about updating the Fusion catalogues. Gary, can you provide a status on Crown, PWS? Daval we’ve had approval for an update on bedrooms, but were instructed to hold off due to the Insight project. Subject: RE: Yet more catalogues out of date… is it time we move software? I still haven’t received an update on this. We are in the midst of losing another customer. We need answers please. So, there we have it. The public line always given to me, over the years, has been ‘The manufacturer isn’t supplying us the data’ but the real story is Fusion won’t do the update until the manufacturer pays. The manufacturers won’t tell us this, because I’m sure they don’t want to upset Fusion. Planit has a lot of businesses like mine using their software so it’s very important for manufacturers to have their products available there. Indeed, I wouldn’t consider replacing Daval, PWS or Crown with another supplier unless their products were available within the design software we use. I don’t have a problem with manufacturers being charged, but I’m not keen on how it’s been hidden from view and I’m very displeased the current situation is that catalogues are out of date and updates and fixes not being carried out. If only the industry had a more open system and manufacturers could more easily create their own data. We have every supplier send us price lists by email, mostly excel with a few using CSV. I then import and reformat these to suit our needs and our business system. If only they could send us a file for design software in the same way. Maybe, one day, we’ll all be using software like Sketchup and manufacturers will send us catalogues directly. Could you imagine if you could only send a spreadsheet to your customer if you paid Microsoft to create and update it for you? We’re going to move to another software solution. I’m absolutely certain there will be some annoyances with that software – maybe the pictures aren’t as nice, maybe it doesn’t allow us to import 3D objects we’ve designed in sketchup (for our more bespoke solutions), but the truth is I’d rather have the up to date catalogues. So important is the data to my business, we’ll be spending several thousand pounds a year for the alternative software. The data really is the valuable bit. My biggest concern remains that the system we move too will at some point in the future also deteriorate into not maintaining manufacturer catalogues. We use different software for bathroom design (better 3D objects, no pricing but that isn’t so important in bathroom design) and they too go through phases of being slow to update some catalogues.